The building presently standing on the land at the corner of Finlay Drive and Armadale Street is the Gospel Hall, now closed, and previous to this the land was used by the Dennistoun Picture House demolished in 1970. Nixon Blue Ltd purchased the site and an application to build 31 residential flats here at address 100 Finlay Drive was submitted in November 2017 but was refused in February 2018. 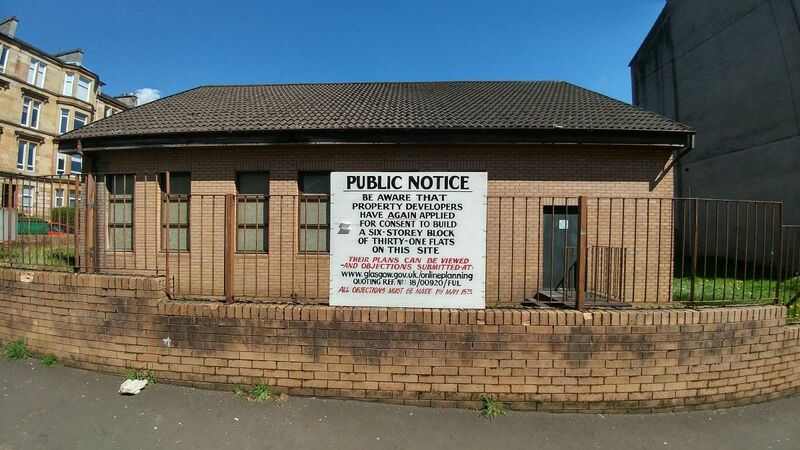 A revised planning application was submitted on 3rd April 2018 and Dennistoun Community Council have submitted a letter of objection after extensive discussion with the public at their meeting on 8th May 2018. Neighbour and others on the forum stated their grounds for objection and bringing to the attention of others that if you submitted an objection the first time, that you would have to do so again. The last date for comments on this revised submission is Tuesday 15th May 2018.